Celebrate Nikon’s 100 year history of providing the world with imaging devices that help tell the stories that matter—printed as limited edition posters—these posters are sure to delight any Nikon fan and beautiful enough to adorn a home, office or studio. Ten designs, each of an iconic Nikon camera with a limited production run of 100 first edition prints. Nikon cameras are designed as the gold standard of functionality and usability that discerning photographers demand, and the cameras themselves exhibit a style of industrial design beautiful enough to adorn anyone’s home, office or studio. To celebrate Nikon’s 100th Anniversary, we have created a limited production run of 100 first edition prints of each of 10 stunning designs. Each poster is printed on fine art paper, using archival printing processes and hand numbered and embossed with a special seal. Each poster measures 19½ x 19½ inches including a ¾ inch white border and is masterfully framed by the team at Level Frames. Framed and matted, each poster measures 23 ½ x 23½ inches. From the depths of the sea to outer space and everywhere in between, Nikon cameras are often found in the hands of some of the world’s most talented photographers. Each poster celebrates the functionality and artistry of Nikon’s industrial design; the same industrial design that helps you easily capture memorable moments of your life. 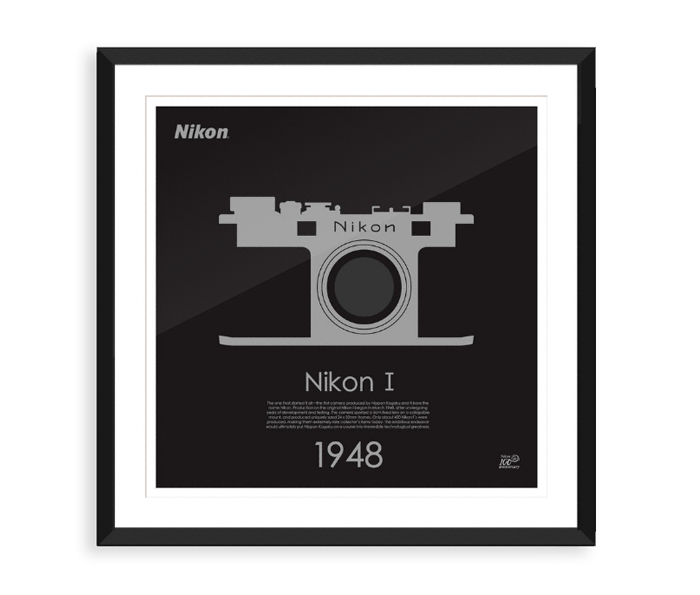 Celebrate Nikon’s 100 year history of providing the world with imaging devices that help tell the stories that matter—printed as limited edition posters—each poster is sure to delight any Nikon fan. Each 100th Anniversary Limited Edition Poster is printed on fine art paper, using archival printing technique and embossed with a special seal. Best of all, each poster is also hand numbered as 0/100, framed and ready to hang in your home or office. Own this piece of Nikon history today. We know you will love and treasure the poster(s) we have created, so we partnered with Level Frames to provide our customers with premium frames for each poster—not only does the frame help protect this collectible item, it is all ready to hang in your office or studio. Each framed poster, with the recommended matte measures 23½ x 23½ inches—you can customize the frame to your liking at Level Frames before completing your order*. *Price of framed print will vary depending on customization to the frame. Celebrate Nikon’s 100 year history of providing the world with imaging devices that help tell the stories that matter—printed as limited edition posters—these posters are sure to delight any Nikon fan and beautiful enough to adorn a home, office or studio. Ten designs, each of an iconic Nikon camera with a limited production run of 100 first edition prints. Each poster is printed on fine art paper, using archival printing processes, hand-numbered and embossed with a special seal. Each poster is also beautifully framed by Level Frames to your liking. Perfect as a gift, each framed poster is a great gift for anyone passionate about photography who appreciates the simple, functional and iconic design of Nikon cameras.